This is a red oak, all wood, spiral staircase that meets UBC building code. 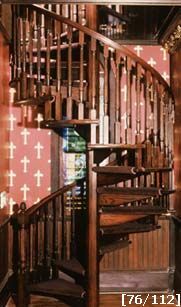 The stair is 64" in diameter built with a clockwise rotation. The handrail is a # 237 with # 342 balusters spaced less than 4". The treads are # 140 with a nosing. The center column is 5 ¼" diameter solid wood with a custom shape. The stair is finish sanded in the shop ready for a final finish application by owner.